We have tested a number of different water heating elements in several configurations. • 4500W 240V Water Heater Element is the "standard" and recommended element for USA tanks. Tested up to 1280W with the bigger box. Can work down to 500W, read more below for somewhat more efficient solutions at lower power levels. 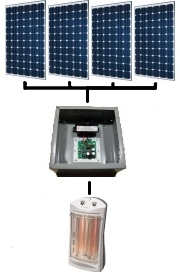 • 1500W 120V Water Heater Element (Home Depot) using 400W of "48V" configured 12V series connected solar panels, meaning 84V open circuit max. and also up to 750W (3 x 250W in series and bigger box). MPPT worked perfectly with the standard Solar Hybrid Hot Water Controller as shipped. Total daily power output to the water is only a little more efficient (mornings) than a standard 4500W 240V element but may not be worth the drain and changeout of the element for 750W input. Note that 1500W elements are found on some smaller size tanks that use 120V. This was mostly a low power test at 400W for people who want to run a small tank, like maybe 20 gallons. The 750W test (with bigger box) shows that you might get a little more power in the mornings etc.. on a bigger more normal tank, and the heatsink temps are still within limits. WARNING - DO NOT GO ANY HIGHER WATTAGE WITH THIS ELEMENT !! • 2000W 120V Water Heater Element (Home Depot) using 500W (2 x 250W and Eaton box only). MPPT worked perfectly with the standard Solar Hybrid Hot Water Controller as shipped. Total daily power output to the water is a little more efficient (mornings) than a standard 240V 4500W element but may not be worth the drain and changeout of the element. Note that 2000W elements are found on some smaller size tanks that use 120V. This was mostly a low power situation at 500W for 1 person who does not use much hot water. Working on a 50 gallon tank for months (still going). 500W is great with this element for low very conservative use in a more off grid situation, like using a generator or grid with a MANUAL, HAND PLUG IN (2 socket setup, one solar side) for more than a few bad solar days, connected to the normal top connection on the tank so the upper element comes on first, both elements changed out. This element will also work on a small tank, like 10 gallons, with only one 250W panel. Although not very efficient, tests showed a 16F rise in 7 hours on a well insulated tank. Why 7 hours? The single panel got shaded at 3PM for this test. For a off grid cabin with low use this may work for you. WARNING - DO NOT GO ANY HIGHER WATTAGE THAN ABOUT 500W WITH THIS ELEMENT!! This means DO NOT TRY IT ON 750W - The controller gets too hot! DO NOT GO THERE EVEN WITH A BIGGER BOX! You don't need to do this at 750W anyway so DON'T DO IT! You want to smell smoke? • 200W 12V Immersion Heater for RV or a 200W 12V Car Heater using 200W of "24V" solar panels, meaning 42V open circuit max. This was just an experiment but the fan did run at about the same speed as normal. These heaters are sold to defrost windshields on cars where the defroster isn't working and plug into a car cigarette lighter socket. MPPT worked perfectly with the standard Solar Hybrid Hot Water Controller as shipped. Due to the lower voltages, a really good larger heat would be needed, like a 1/16 thick or better metal plate backing the Eaton box (box flattened in back) to increase heat sink area when using a 12V element, there is a heat issue and more wattage input will over temp the unit! This was only for testing. Please do not do this with the standard controller. If this is truly your application for the SHHWC, please contact us and we may be able to build you a custom unit for this special application. If you use your imagination and a little creativity in special situations you could maybe use a space heater (like the car heater above) or other resistive element device (with only a heating element, no motors) to heat things, like maybe heating a horse water trough or barrel to keep it from icing over in the winter. It doesn't have to be water that you are heating. Please contact us and we may be able to build you a custom unit for special applications. Please contact us before doing crazy things, you don't want a dead controller and we don't want to have to fix it. Always use a thermostat on any element! A professional installer or electrician should be used for any install. Custom designs, programming and modifications are available along with Engineering Services for other designs and needs..